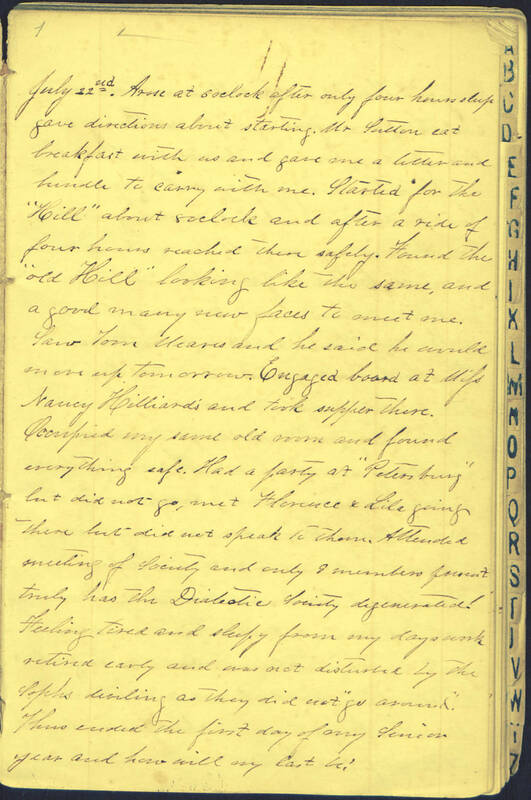 Item Description: Diary entry dated 22 July 1864 describing Henry Armand London’s first day of his senior year at the University of North Carolina at Chapel Hill. Henry Armand London of Pittsboro, N.C., was a journalist and lawyer who attended the University of North Carolina until 1864 when he joined the Confederate army. After the war, he returned to Pittsboro, where he was involved in many business ventures and in community activities. He served as UNC trustee from 1901-1917. Item Citation: Diary entry dated 22 July 1864, in the Henry Armand London Papers #868-z, Southern Historical Collection, Wilson Library, University of North Carolina at Chapel Hill. Arose at 6 oclock after only four hours of sleep gave directions about starting. Mr. Sutton eat breakfast with us and gave me a letter and a bundle to carry with me. Started for the “Hill” about 8 oclock and after a ride of four hours reached there safely. Found old “Hill” looking like the same, and a good many new faces to meet me. Saw Tom Meares and he said he would move up tomorrow. Engaged board at Miss Nancy Hilliard’s and took supper there. Occupied my same old room and found everything safe. Had a party at “Petersburg” but did not go, met Florence & Lila going there but did not speak to them. Attended meeting of Society and only 9 members present, truly has the Dialectic Society degenerated. Feeling tired and sleepy from my days work retired early and was not disturbed by the Sophs deviling as they did not “go around.” Thus ended the first day of my senior year and how will my last be! This entry was posted in Southern Historical Collection. Bookmark the permalink.